Flash storage offers unmatched efficiency and capacity, but is expensive to implement. For this reason companies are opting for hybrid storage solutions that combine flash with lower-efficiency, lower-cost options. 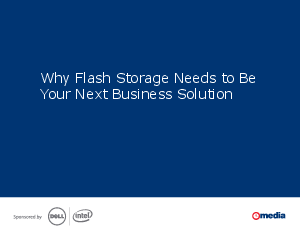 Customers can determine how to use flash based on their own storage and capacity needs. Dell has a strong flash portfolio available in every product line it offers.